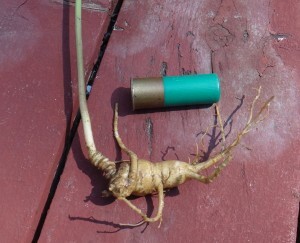 Commercial ginseng production has a long history and affiliation with Cornell University. I have a collection of Cornell publications dating from as early as 1904 on topics as specific as “Phytopthora Root Rot of Ginseng” and as general as “Diseases of Ginseng”. At one time, circa 1910, there were as many as 5,000 ginseng farms in upstate NY and Cornell conducted a great deal of research on what was a new crop for many NY farmers. Almost all the commercial ginseng grown in NY in those days utilized wooden lathe houses to grow this shade requiring herbaceous perennial. 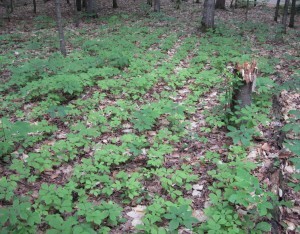 One might wonder why natural forest shade was not utilized, since ginseng has always grown wild in some NY forests. Many people are unaware of the fact that there were virtually no forests at the turn of the last century in upstate NY. Almost the entire state was devoid of forest cover then, (less than 15% forested) whereas today, over 60% of NY state is forested. Modern ginseng cultivation today ranges from extremely intensive, high input, high risk, field production utilizing polypropylene shade cloth, with production costs alone of at least $65,000 per acre to establish and grow a three year crop, to less than a $100 investment in seed that may be grown in a “wild simulated” manner in a woodlot. Whenever a “wannabe” farmer visited me in my office with his or her idea on how they were going to become rich growing something or raising something, my first question to them always was “Who are you going to sell it to and how do you plan to market it?” This query was often met with blank stares since the assumption was that if one was really good at growing something, the world would beat down the door to purchase it. Sadly, for almost every agricultural commodity I know of, that is not the case. Ginseng is the only crop that has a list of more than 300 registered buyers, on file, by the NYSDEC. Of course, most of these buyers are primarily interested in buying wild ginseng, but the fact is that ginseng is indeed easy to sell. Growing it successfully is a different story, however! If it were easy to grow or if it grew in any forest, it would not be as expensive as it is to buy. Wild simulated woodland ginseng growing requires a specific type of forest habitat and there are certainly challenges to doing it successfully. The first and by far most important step, is to assess the available forest resource to see if it is suitable for ginseng production. Many years ago I developed and I still continue to “tweak”, a tool called “Visual Site Assessment and Grading Criteria for a Potential Woodland Ginseng Growing Operation”. This is available as a free PDF download at the Small Farms Website. It does require knowledge of the herbaceous plants in your forest, as well as the tree and shrub species, to use it accurately. A six year old ginseng root from wild simulated patch. If you think you have a suitable forest, the next step is to purchase stratified seed from a reputable dealer and try some test plots. 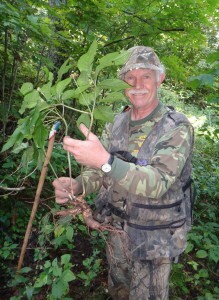 One such reputable dealer is Scott Persons, author of “Green Gold” and his most recent book, co-authored with Dr. Jeanine Davis from NC State “Growing and Marketing Ginseng, Goldenseal and other Woodland Botanicals”. I highly recommend this book for anyone who is interested in growing ginseng, goldenseal, black cohosh, ramps, bloodroot, or any other woodland crop. Scott’s email is wasp3@frontier.com. Although it now October, ginseng is always planted in the fall and may be sown right until the ground freezes. If Scott has sold all his seed, you may contact me rlb14@cornell.edu and I may be able to suggest other reputable seed sellers. Expect to pay about $25 per ounce of seed, less if ordered in bulk, but be sure to buy only stratified seed. Stratified seed was harvested last summer and will germinate next spring. Ginseng seed cannot be held over for spring planting in 2016. It will perish even if refrigerated or frozen. I suggest you begin with some test plots. Here is a protocol that I use myself after I determine that a particular site looks promising. Measure and mark 3-foot-wide by 3-foot-long test plots using survey flags. Survey flags are available from farm and home stores, forestry suppliers, or many County Soil and Water Conservation districts. Set up as many 3 foot square plots as you desire. I suggest at least 10 plots per acre or one each per 4,000 square feet. Two ounces of seed will be enough to create about 16 test plots. Count out seeds into batches of 50 seeds. Package each individual 50 seed batch in small plastic baggies. Rake back the leaves from each plot and scratch the surface of the soil with a 3 tined tool or a grub axe or some similar tillage implement. Remove big rocks or roots that would prevent the seeds from making direct contact with the soil. Scatter 50 seeds evenly over each 3 foot by 3 foot test plot and walk on them to ensure good soil contact. The best time to plant in upstate NY is September through mid-October but you can plant right up until the ground freezes. Rake leaves back over each plot. Leave survey flags in place over the winter! Number or code each test plot by writing a number or code letter on the survey flag. Record all data in a permanent notebook. If you don’t do this you will surely forget! Take pictures too! Begin inspecting plots as soon as the snow melts the following spring and check for slugs. Imported (exotic) garden slugs are perhaps the main reason why ginseng seedings fail in year one. Position slug traps, one at each plot, to survey slug populations. An inexpensive slug trap is made using a few ounces of beer as bait. Cut off two or three inches of the top of a one liter soda pop bottle. Reverse the cut off top so that the cap opening is inside the bottle and staple it in place. This allows the slugs to easily crawl into the bottle and then they fall into the beer and cannot crawl out. Position the bottle at ground level within the test plot. If you trap more than one or two slugs per plot in the early spring (late March to April), prior to seed germination in May, you will need to provide slug control by using poison baits. Beer traps are not effective as control agents but work well for survey purposes. Organic growers have several pesticide options available such as “Escargro” or “Sluggo” products. Conventional growers have even more options including poison baits made from metaldehyde (i.e. Deadline slug pellets). Read and follow all label directions when using any sort of pesticide, organic or conventional. Count the number of emerged seedlings in May, (the number you count times 2 will be your approximate germination percentage) and continue to count them every week or so until fall (this number times 2 will be your seedling survivability percentage). Record all data in the permanent notebook. A record keeping sheet should have columns with the following headings. Test plot number, date planted, today’s date, # of emerged seedlings, # of slugs trapped, soil conditions (i.e. dry, moist soggy etc), other observations. This information will be extremely important for any serious grower to provide complete documentation of the endeavor as well as to allow future information for pest management thresholds, etc. By Fall, you can determine which of the plots performed best and expand the plots in that immediate area to 10 foot wide by 10 feet long. These may be seeded next fall at one ounce per plot. Abandon areas that have poor germination and or survivability. Within a few years you will have located the very best locations for serious expansion. Thin successful test plots after three years of growth to a density of one plant per square foot, transplanting surplus roots in September. Of course, the bottom line when growing any crop is, the bottom line! Currently, good quality 8 to 10 year old wild simulated ginseng is being sold for upwards of $800 per dry pound, or $200 per fresh weight pound. A good wild simulated yield could be as much as 300 pounds fresh weight per acre. In the right location, this can be a very profitable crop that requires very little maintenance once established. Bob Beyfuss, rlb14@cornell.edu, retired in 2009 from Cornell University Cooperative Extension, after 31 years as an Agriculture agent in Greene County. He is the author of “The Practical Guide to Growing Ginseng” (a 65 page grower’s guide), “Ginseng Production in Woodlots” and “The Economics of Woodland Ginseng Production”. Currently, Bob is Vice President of American Ginseng Pharm, a large scale woodland ginseng/herb/mushroom growing business in Greene and Delaware Counties, NY. Thank you for this very practical and useful guidance! I have copied your request over to the author, so keep an eye out for an email coming your way! I am also trying to purchase the “Practical guide to growing ginseng”. I just checked Amazon and it’s not available. Also,is Bob still available for contact at the email above? I’ve emailed the author with your request. Expect an email upon his reply! The guide is available from the Agroforestry Resource Center of Cornell Cooperative Extension of Greene County. You can reach them at: 518 622 9820. I hope this helps!